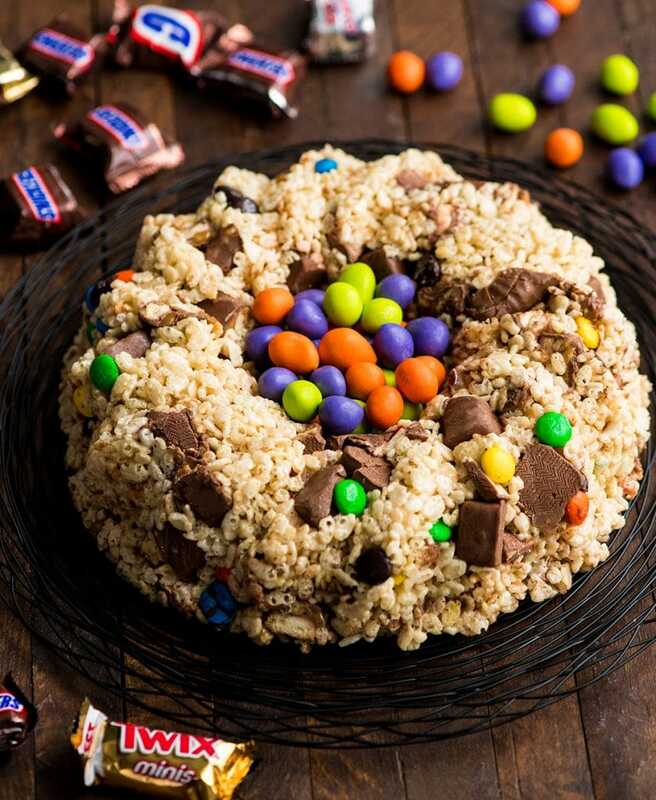 This Candy-Stuffed Rice Crispy Cake is an easy dessert recipe that is perfect for entertaining! It’s made with 5 ingredients and comes together in 10 minutes! A great recipe to use up all your leftover Halloween candy! I mean, can you blame them? Dressing up like a princess or superhero, knocking on doors and getting candy just for saying 3 words and flashing a cute smile, and getting to eat candy for months is every child’s dream right? But I don’t think it’s just the day of Halloween that is exciting for my kids. It’s the arrival of fall that brings excitement for the holiday and the rest of the season to come. Visits to the pumpkin patch, farmer’s markets and neighborhood Halloween parties (that start as soon as the first leaves fall from the trees) are all reasons to love October! However, we have four kids in the trick-or-treating game. So we always end up with our fair share of candy. And come November 1st, I start trying to find fun and creative ways to use it. 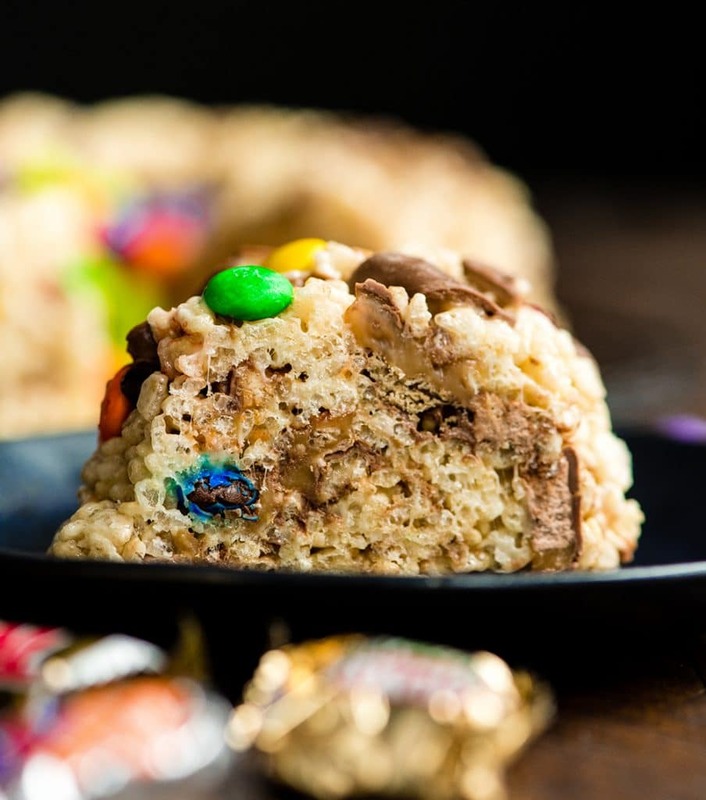 Like this super fun Candy-Stuffed Rice Crispy Cake recipe! 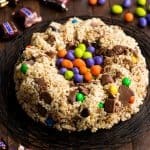 This Rice Crispy Cake loaded with Mars chocolate candy is perfect for your pre or post holiday needs! It’s a quick, easy, and fun recipe that feeds a crowd! Plus it’s totally customize-able! 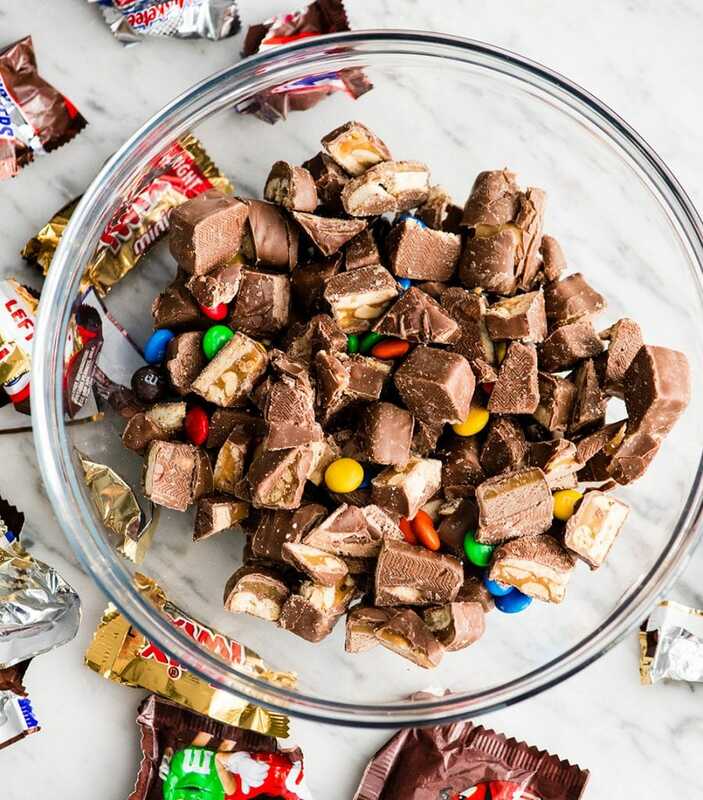 Use your favorite Mars chocolate candies (SNICKERS®, TWIX®, MILKY WAY®, 3 MUSKETEERS®, and of course…bring on those peanut butter M&M’S® for me) to create the perfect centerpiece for the dessert table at your Halloween gatherings! Where to buy the best Halloween Candy (AKA: Mars candies)! Even though we end up with piles of candy on Halloween, we still buy pounds of it beforehand! Actually our neighborhood is pretty amazing when it comes to the sheer volume of trick-or-treaters (we’re talking thousands of children walking around, no exaggeration). And we don’t want to be the house that runs out of candy (gasp), so we always make sure to purchase plenty at Walmart! For the best price and selection, we always stock up on Mars candies at Walmart early in the season, so we can be sure to snag the best varieties! I love the festive packaging too, like the Mars Mixed Minis Witch Bag! 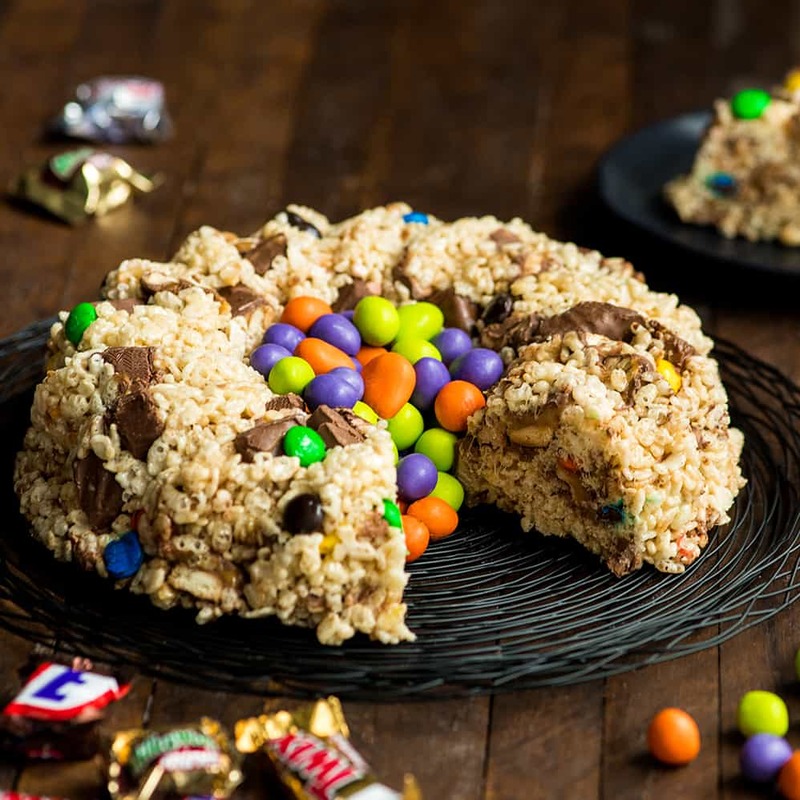 And the festive colors of the M&M’S® Ghouls Mix makes them perfect to serve at parties or decorate treats with, like this Candy-Stuffed Rice Crispy Cake! Grab your Halloween candy from Walmart! How to make a Rice Crispy Cake! As always, I’m going to start by walking you through the process of making this Candy-Stuffed Rice Crispy Cake! 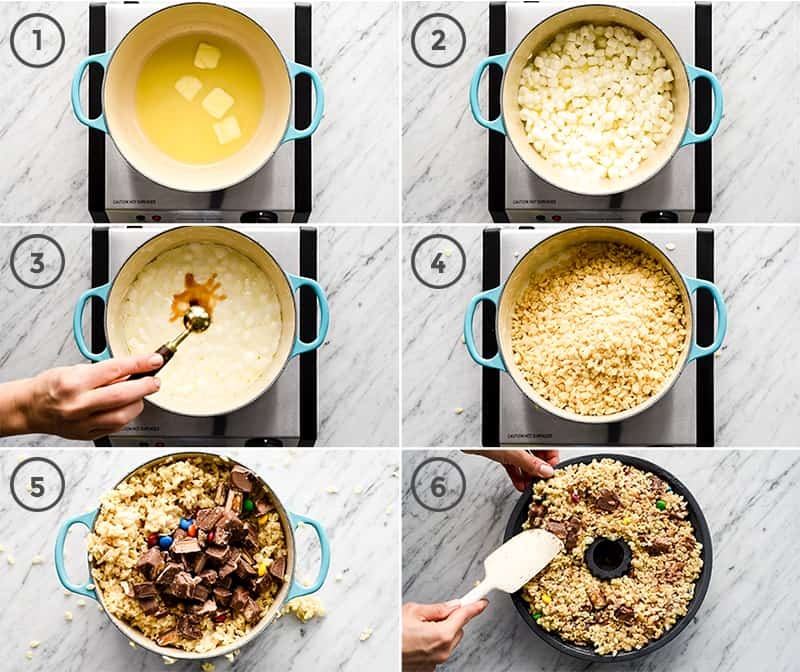 It’s super simple to put together, but there are a few tips and tricks that will ensure your rice crispy cake making success! Step 1: Chop and freeze Mars candies! Chop! The very first step in this recipe is to chop the Mars candy. The Mars Mixed Minis® are already cute and bite-sized, but in order for the candy to be evenly distributed throughout the cake it’s important to chop it up! Freeze. Once you have chopped the candy to your desired size, place it in a bowl and put it in the freezer while you complete the rest of the recipe. Keeping the Mars chocolate candies frozen will ensure that they hold their shape and do not melt too much when added to the warm rice crispy cake mixture! Making the rice crispy cake base is super simple! Here are a few tips and suggestions to ensure it turns out perfectly! My first tip is this: Use a large, deep pot. my vessel of choice was a tad to small to make this recipe (but it videoed well lol). Be sure to choose a pot where you won’t have to worry about spilling/overflow! (Mostly) Melt the butter first. As you can see in the photo below, I wait until the butter is mostly melted until adding the marshmallows to the pot. The reason I don’t wait until it’s all the way melted is because sometimes it starts to brown or burn, which I don’t prefer! Add the marshmallows and stir! It’s important to stir the mixture every minute or so after the marshmallows have been added to the mostly melted butter. This will ensure it doesn’t stick to the bottom of the pan! Add vanilla. When the vanilla extract is added it often bubbles a little, this is totally normal and should be expected. Stir the mixture until it’s smooth and homogenous (uniform throughout). Remove from heat and add Crispy Rice cereal and sea salt. The final step in making the rice crispy cake base is to add the cereal and sea salt and stir the mixture until it is uniform throughout. Be sure to stir quickly and work quickly so that the mixture doesn’t harden before it can be molded into a cake! Step 3: Add the Frozen Candy! As soon as the rice crispy cake mixture is well-mixed, remove the frozen and chopped Mars candies and stir quickly until it is evenly distributed throughout the rice crispy mixture. Step 4: Make the Bundt cake! Transfer the mixture to the cake pan. I cannot stress the importance of working quickly enough! Transfer the candy-filled rice crispy cake mixture from the pot into the prepared cake pan. I used a silicone Bundt pan and highly recommend using a silicone pan for easy release! If you only have a regular Bundt pan, that’s totally fine! Just be sure to grease it really well! It doesn’t have to be a Bundt. 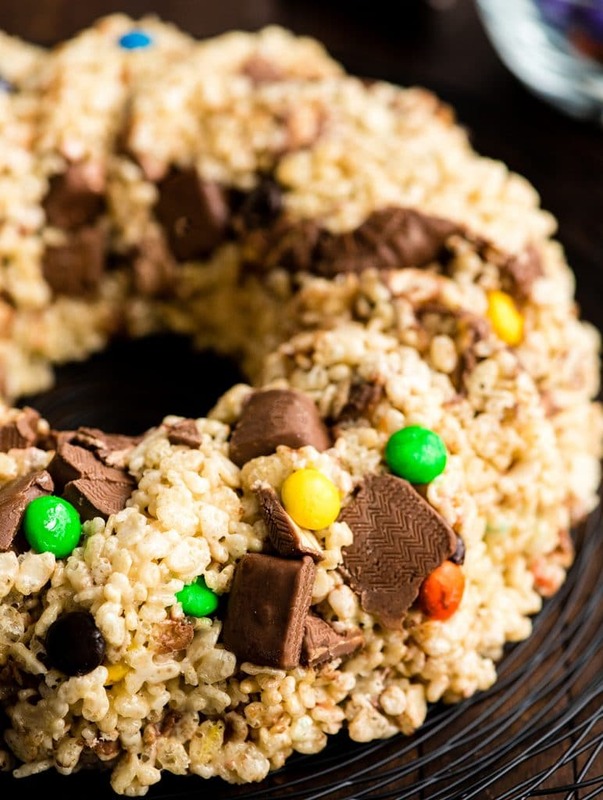 While I think a Bundt cake is the perfect shape and size for serving (filled with some Mars holiday M&M’S® candies for presentation, of course), feel free to make this rice crispy cake recipe in any shape you’d like! Again though, I recommend using a silicone pan/mold! Press the cake mixture into the pan. The candy/crispy rice mixture is sticky. So I recommend using a greased spatula or greased hands to press it into the Bundt pan. Be sure to press firmly to remove any air pockets! Let it cool. To be sure that the cake will hold its shape when removed from the pan, make sure it cools to room temperature (which takes at least 1-2 hours). You can speed up the process by putting the cake in the pan in the refrigerator, however this rice crispy cake recipe tastes the best when served at room temperature! So be prepared to let it warm to room temperature a bit before serving! Step 5: Remove the rice crispy cake from the pan! Silicone pan. Once the Candy-Stuffed Rice Crispy Cake has cooled, it’s time to serve! If you use a silicone pan, removal is a breeze! Gently squeeze the sides of the pan to loosen the cake. Then turn it over onto your serving dish of choice and remove the silicone bundt pan! It’s really a breeze! Regular pan. If you use a metal or glass cake pan, simply run a knife between the cake and the edge of the bundt pan to loosen the cake. Then invert the pan onto your serving plate and shake it to release! 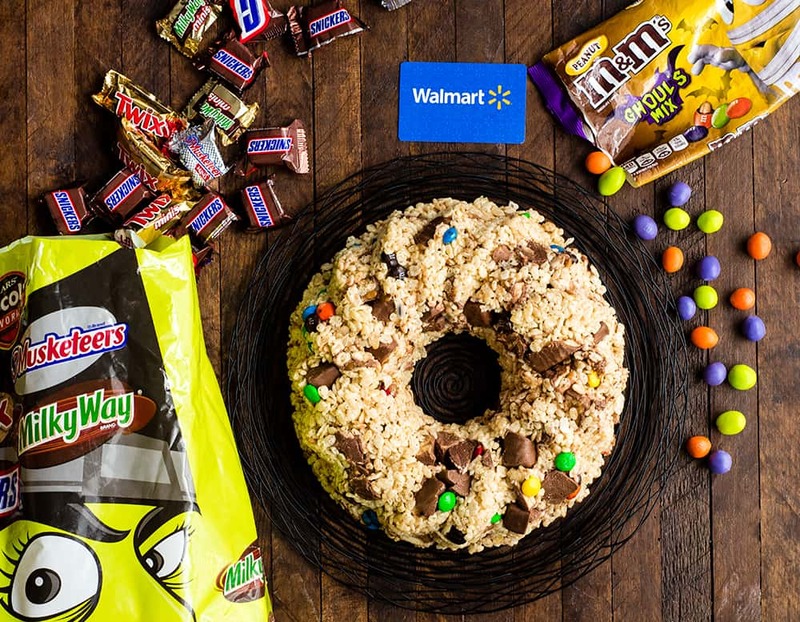 To serve, fill the middle of the bundt with festive M&M’S® candies or other festive halloween candy! I recommend serving small slices because a little bit goes a LONG way with this rice crispy cake recipe (since it’s totally loaded with delicious candy)! This rice crispy cake recipe only has 6 ingredients, which means it’s super easy to make! But lets chat about those ingredients and possible substitutions! Butter. The butter is a key ingredient in this rice crispy cake recipe. It adds so much flavor I cannot, in good conscience, recommend any substitutions. Feel free to use salted or unsalted butter! Marshmallows. I highly recommend using mini marshmallows because they are the easiest and fastest to melt! In a pinch I have used leftover large marshmallows from s’mores making...but they are not as easy to work with! Crispy Rice Cereal. I always recommend the generic brand because it’s SO much more affordable than name brand cereals, and they taste identical! You can also use brown crispy rice cereal instead of white if you prefer! Vanilla Extract. I adore the extra vanilla flavor in this rice crispy cake. You could substitute vanilla bean paste or actual vanilla beans if desired! Sea Salt. Ok, the addition of sea salt takes this rice crispy cake recipe from good to great. You technically can omit it if sodium intake is a concern for you, however I don’t recommend it. The extra saltiness really makes this recipe shine. Mars Candy. Feel free to use your favorite variety of candy! I prefer the chocolate varieties, but taking this recipe in a fruity direction by using SKITTLES® candies and STARBURSTS® candies is also a totally viable option! IF YOU MAKE SOMETHING FROM JOYFOODSUNSHINE I WOULD LOVE TO SEE YOUR CREATIONS! DON’T FORGET TO RATE THIS RECIPE AND LEAVE A COMMENT BELOW! ALSO, FOLLOW ALONG WITH ME ON INSTAGRAM, PINTEREST, FACEBOOK AND TWITTER FOR MORE RECIPE INSPIRATION AND A GLIMPSE INTO OUR EVERYDAY LIFE! 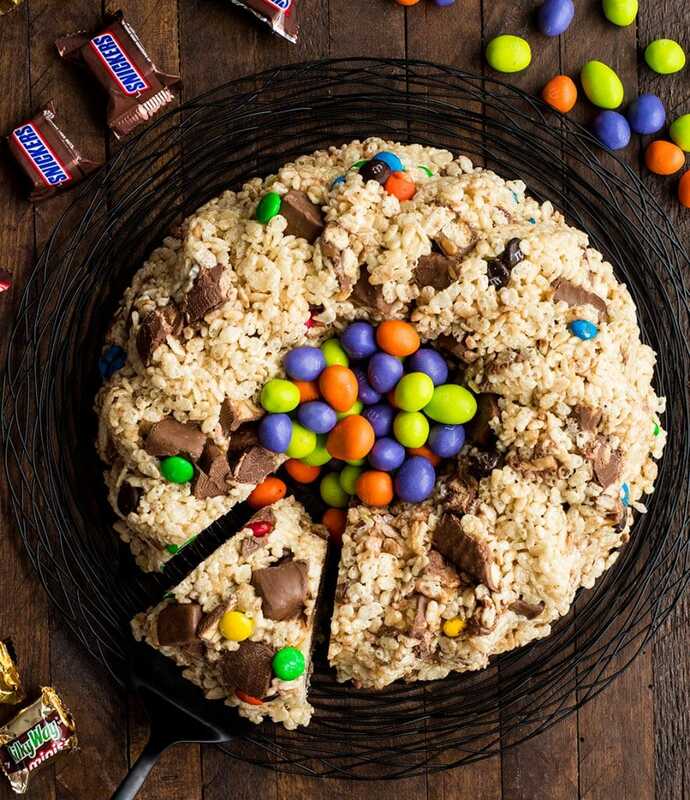 This Candy-Stuffed Rice Crispy Cake is an easy dessert recipe that is perfect for entertaining! It's made with 5 ingredients and comes together in 10 minutes! A great recipe to use up all your leftover Halloween candy! 4 cups chopped Mars Candy chocolate variety pack! Grease a round, silicone Bundt cake pan. Set aside. Unwrap and chop 4 cups of Mars chocolate candies and place into a medium bowl. Put the bowl of chopped candy in the freezer. Once the chopped candy is in the freezer, melt butter in a large, deep sauce pot over medium heat. Once butter is mostly melted, add marshmallows and stir until smooth (this takes about 3-6 minutes). Once butter/marshmallow mixture is smooth, add vanilla extract and stir to combine, then remove from heat. Add crispy rice cereal and sea salt to the large pot with the marshmallow mixture and mix until thoroughly combined. Remove frozen Mars candies from the freezer and add them to the rice crispy mixture, stirring until evenly distributed. Pour the mixture into the prepared Bundt pan. Use a greased spatula or greased hands to evenly spread the mixture into the pan. Make sure to press down on the mixture to remove any holes/air pockets. Allow the rice crispy Bundt cake to sit at room temperature until it has cooled, about 1-2 hours. Turn the Bundt pan onto a serving plate and remove the cake. Decorate as you wish (extra candy, holiday M&M’s, sprinkles etc.) and serve! This post contains affiliate links, which means that if you purchase a product through a link you clicked on here, I receive a portion of the sale. 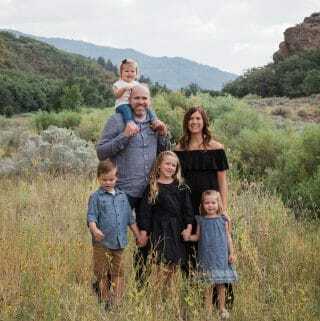 Thank you for supporting JoyFoodSunshine! Leave a comment and review below, then take a picture and tag @joyfoodsunshine #joyfoodsunshine on Instagram so I can see it! Sign up here to receive weekly e-mails! This is the BESTTTT kid themed cake that I would LOVE because I love candy. Peanut M&Ms or Peanut Butter M&Ms are my favorite; honestly I don’t love most of Halloween, but I do love the candy bunches and bunches.